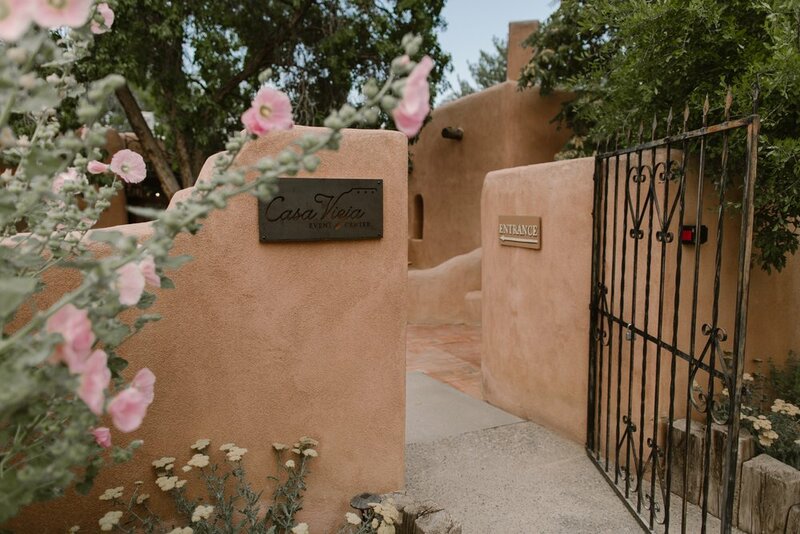 Casa Vieja was originally built as a home in the 18th century by Salvador Martinez on land purchased as part of the Alameda Land Grant from Juan Gonzales Bas I. The Village of Corrales was an attractive location for many families due to the inexpensive farmland, proximity to the Rio Grande river valley, and rural setting. Over time, the Martinez family home began to deteriorate due to the hardships they faced in the 1930’s from The Great Depression and WWII. The Harrington Family moved to Corrales in 1941 from Sioux City, Iowa and purchased the empty Martinez house. They immediately began restoring the old building; concerned with preserving the integrity and heritage of the structure. Only five of the original twenty rooms were still intact. Mrs. Dorothy Harrington gave the name “Casa Vieja” or “Old House” to the building during this time. Many of the additions from this time period still remain like the carved rope trim around the doors and chip carving on the bookcases (done by the Harrington family), flagstone and brick floors (installed by Gardetti, an Italian stonemason), and hand-hewn kiva fireplaces and nichos (crafted by the renowned fireplace builder, Fecho Chavez). Dorothy and Tom Harrington divorced in 1950 and sold Casa Vieja to Dr. Alan Jacobson. He and his family lived in part of the home (his two daughters shared a bedroom in what is now the bar) and converted the rest into a small hospital. They also installed a swimming pool at the far west end of the property. In the 1970’s, the building was purchased by the Bentley Family and converted into a restaurant. It was a local hot spot for fine dinning in Corrales for many years. Chef Jim White and Chef Josh Gerwin were among some of the previous culinary artists to call Casa's kitchen "home". In 2016, the Socha Family purchased Casa Vieja and after extensive repair and restoration they converted it into the beautiful Event Center it is today.